Heat oven to 400 degrees. Arrange sweet potatoes, pricked with a fork, on rimmed baking sheet and roast until tender, about 45 minutes. Let cool slightly. Slice tops and mash sweet potatoes with a fork. 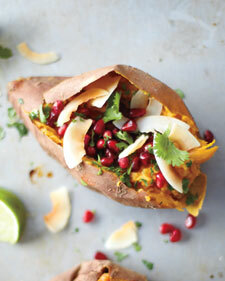 Divide coconut milk, coconut flakes, cilantro, and pomegranate seeds among sweet potatoes. Season with salt. Garnish with additional sprigs of cilantro and serve with lime wedges.